This “geographical shuffling of low-income people at the behest of those with money” is currently an important issue in San Francisco, New York, Boston, Seattle, and other big American cities. Therefore, I find it notable that, in THE EPIC FAIL OF ARTURO ZAMORA, a tween character explains the term “gentrification” to Arturo Zamora. 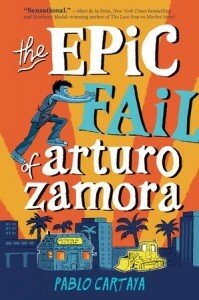 THE EPIC FAIL OF ARTURO ZAMORA, set in a Cuban-American neighborhood in Miami, involves a developer who comes into town with big plans that threaten to radically disrupt the lives of the extended Zamora family and their beloved, decades-old family restaurant. The family and their friends must galvanize opposition to the potential displacement and develop a campaign for its defeat. The story takes place over three weeks during the summer vacation that precedes Arturo’s entrance to eighth grade. Arturo has a summer dishwashing job at the family restaurant. His buddies Mop and Bren are preparing to leave town for summer adventures. Meanwhile, Carmen, whose parents were old family friends of the Zamoras, has just arrived from Spain with her father for the summer. They are mourning the recent loss of Carmen’s mother. Throughout THE EPIC FAIL OF ARTURO ZAMORA, we repeatedly encounter the poetry of and information about the life of legendary Cuban hero José Martí. Since the thawing of U.S. relations with Cuba has been in the news over recent years, this exposure to Martí may well prompt young readers to learn a bit more about the island nation that is situated so close to America. And since the story revolves around the family restaurant, there are plenty of traditional Cuban dishes constantly being prepared, served, and eaten. What THE EPIC FAIL OF ARTURO ZAMORA shows us is that, while change is inevitable, we, as a society, repeatedly struggle to strike a balance between embracing change and holding onto the traditions and connections that make us who we are. These days, in a mobility-driven America, extended families living in close proximity are nowhere near as commonplace as they once were. The fictional, Cuban-American Zamora clan harkens back to a time many of us aging readers recall, back when our own immigrant grandparents were still alive and there were big Sunday dinners and close extended family relationships. 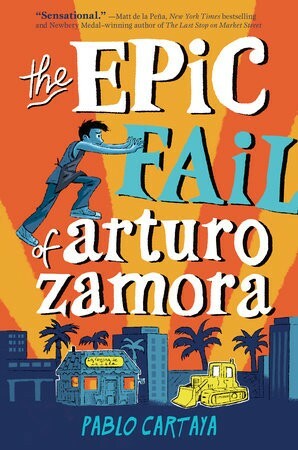 Like those big Sunday dinners from my own childhood, THE EPIC FAIL OF ARTURO ZAMORA is a wonderfully satisfying experience.